The La Plata County Administration Building flagpole on Thursday leans left or right depending on your point of view. 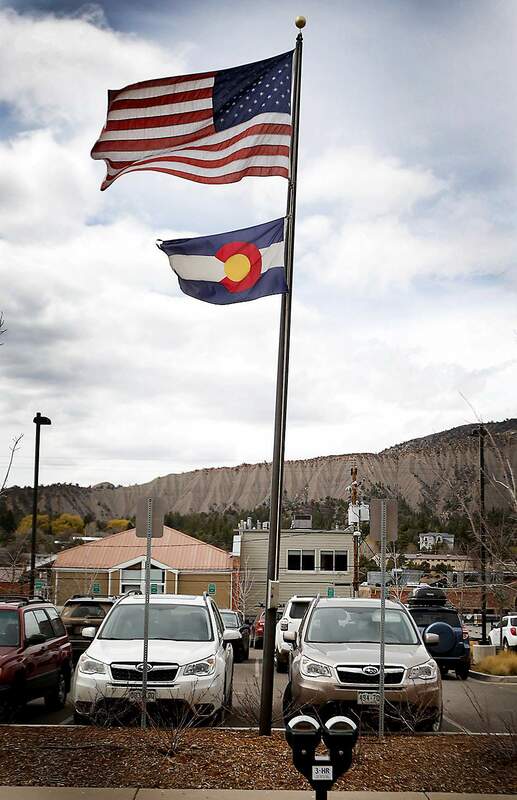 What’s with the listing flagpole at the La Plata County Administration Building at East Second Avenue and 11th Street? The flagpole has been that way since the building opened. Does it imply the political leanings of the county governance depending on whether you view it as left- or right-leaning? The lack of level-headedness of our county leaders? Curiosity got the best of me. Action Line has strolled past that flagpole innumerable times over the years without detecting its obvious tilt. So much for walking the straight and narrow. Not that Action Line ever walks the straight and narrow. But the stars were in alignment for investigating county crookedness. Sure enough, the center pole is pronouncedly out-of-plumb. It’s time to write a polemic. Talk about a plum assignment! Action Line raised a red flag with the Person in Charge of Pretty Much Everything. We’re referring to our good friend Mark McKibben. Mark is the county’s director of general services. He oversees 18 county buildings and facilities, 32 acres of fairgrounds, a 300-vehicle fleet and 368,000 square feet of parking lots, pavement and sidewalks. And a flagpole that isn’t straight. Mark confirmed the flagging flagpole predates the county’s $3.9 million remodel of the former Vectra Bank building in 2015. “It must have been hit by a snowplow years ago or backed into by an inattentive driver,” he speculated. The move has obvious political symbolism. Which is a good thing, considering that many of the county’s rural residents are revolting. The county has a number of upset, passionate citizens demanding immediate changes. A left-leaning flagpole could provoke a flagpole recall petition to remove the standard for bending to outside influences, such as snowplows. Because nonexistent global warming has eliminated winter snowfall in lower elevations of La Plata County, the flagpole is safe from further weather-related abuses. But there will be lingering conspiracy theories from flagpole deniers, especially those who insist the flagpole was manufactured in Kenya. On the other hand, if one were to look at the flagpole from the opposite side of the county parking lot, it would lean to the right. This is completely unacceptable to progressives who piously pilot Prii. Prii is the plural of Prius. The car doesn’t cause much smog, but its drivers emit toxic levels of smug. A right-leaning flagpole will prompt expressions of moral indignation amongst the cognoscenti. There will be marches, social media posts – and boisterous threats to move to Canada. Canada really ought to build a wall. America is not sending its best. Maybe the best solution is to include strict flagpole zoning in Round 2 of the county’s land-use code. After all, a symbol of freedom is best showcased by iron-clad restrictions. Or we can simply wait for Mark and his perpendicular perpetrators to square the thing and prevent pole politicization. Email questions to actionline@durangoherald.com or mail them to Action Line, The Durango Herald, 1275 Main Ave., Durango, CO 81301. You can request anonymity if you persuade the county to name the flagpole Eileen or Lena.